If you know anything about me, you know I love golf. What does that have to do with today’s blog? After we play golf, my father and I usually will grab a bite to eat. Recently, we played a round of golf and grabbed a bite to eat from a small reputable restaurant. We had been to this restaurant in the past, but it was something different about this experience. I won’t mention the restaurant’s name, but I would like to share our experience. My father began to order, but while the young man was taking my father’s order we noticed he was upset for whatever reason. My father paused for a second and young man rudely said, “WHAT?” This made me think about One Reason Why You Should Avoid Arguments. I’m not suggesting for you to walk away from disagreements that need to be addressed, but I am recommending for you to analyze the situation and to avoid situations when you will lose no matter what. For whatever reason, the young man who took our order was ready for a good argument. But to his dismay, he wasn’t going to get the pleasure of arguing with us. After analyzing the situation, my father and I could see why the young man was clearly upset. The restaurant was busy, he looked tired, it was the end of the day, he was the supervisor, etc. It was evident to my father and I that the young man was overwhelmed with work. 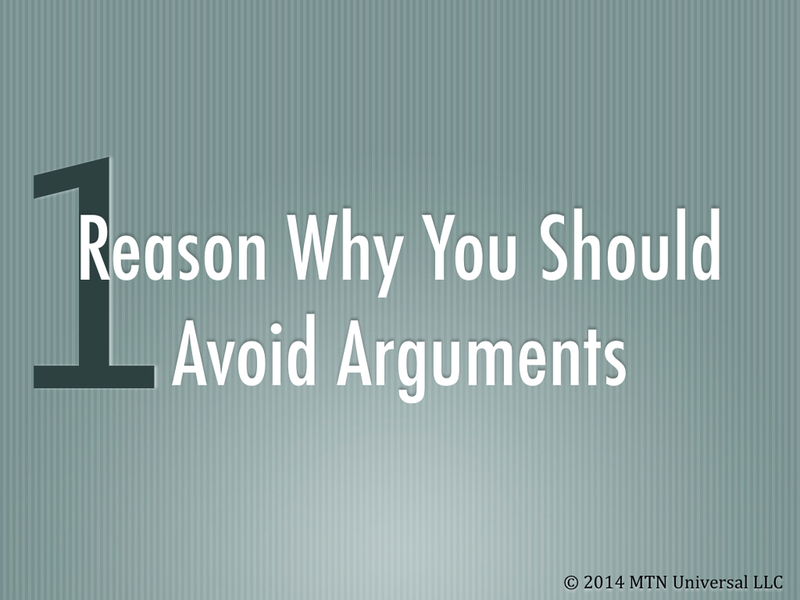 In these cases, it’s a waste of time to argue. First, everyone could see the young man’s tension was high because he was obviously upset. Arguing with anyone in a situation like this will make you look like a fool. In addition, why waste your energy arguing and building up negative vibes when you can be positive and teach him a valuable lesson through your positivity. Don’t waste your time because their will be greater battles to fight. Trust me, you have better ways you can spend your time. So, rather than spending your precious time arguing and fighting instead analyze the situation and discover ways of dealing with these individuals in a positive way. Be the wEiRd this world needs!